Ankylosing spondylitis (AS) is a chronic inflammatory rheumatic disease with predominantly axial symptoms (ie, back pain) as a result of sacroiliitis, spondylitis, spondylodiscitis or enthesitis.1 Radiographic sacroiliitis is the classic diagnostic hallmark of AS and, therefore, is an integral part of the widely accepted modified New York criteria for the diagnosis and classification of AS.2 The modified New York criteria require the presence of sacroiliitis of either grade 2 bilaterally or grade 3 or 4 unilaterally on plain radiographs (definite radiographic sacroiliitis) and the presence of at least one clinical criterion. Although the modified New York criteria perform well in patients with established disease, they have limitations in early disease. There is direct and indirect evidence from several studies that it often takes years from the onset of low back pain until definite sacroiliitis on plain radiographs is readily detectable.3–6 Because of the absence of definite radiographic sacroiliitis during this early disease stage,7 8 the patient cannot be classified or diagnosed as AS according to the modified New York criteria. It has been proposed to consider all spondyloarthritis (SpA) patients with predominantly axial involvement as “axial SpA”, regardless of whether they have definite radiographic sacroiliitis, and to refer to patients without definite radiographic sacroiliitis as “preradiographic axial SpA” or “non-radiographic axial SpA” to underline the fact that radiographic changes are not yet present but may appear over time.8 9 Magnetic resonance imaging (MRI) has evolved as an important diagnostic tool in patients without definite radiographic sacroiliitis, because it visualises active (acute) inflammation in the sacroiliac joints.8 10 11 In two studies active inflammation of the sacroiliac joints on MRI was shown to precede by 3 years5 and 7 years,12 respectively, the development of radiographic sacroiliitis in a proportion of patients, thereby supporting the validity of MRI as an appropriate imaging instrument in early disease. Efforts have been made in recent years to facilitate and standardise the making of an early diagnosis of axial SpA.8 13 However, there is no consensus on when to consider a patient as having non-radiographic axial SpA. Established criteria such as the European Spondylarthropathy Study Group (ESSG) criteria14 and the Amor criteria15 were developed before MRI was available. Moreover, both classification criteria address the whole group of SpA and do not particularly focus on axial SpA. Therefore, the aim of this study was to develop candidate criteria for the classification of axial SpA that are applicable to patients with or without radiographic sacroiliitis. Such criteria would facilitate the conduct of clinical trials in patients with non-radiographic axial SpA (ie, axial SpA without sacroiliitis on conventional x rays), which is currently considered an unmet need. Members of the Assessment of SpondyloArthritis international Society (ASAS) who are considered experts in SpA were invited to participate in this study. Twenty ASAS experts (all listed as co-authors) agreed to participate and reviewed the clinical data of real patients (n = 71) who had presented previously to the Rheumatology Outpatient Department of the Charité, Campus Benjamin Franklin in Berlin, Germany. The 71 patients were selected because of chronic back pain of unknown origin and a possible diagnosis of axial SpA (“patients difficult to judge”). All relevant clinical data were presented on paper to each of the 20 experts in the format of “paper patients”. Clinical data included gender, age, duration of back pain, clinical history, laboratory tests and imaging results. Clinical history was presented according to the judgement of the local rheumatologist in Berlin in a categorical manner as “yes” or “no”. The clinical history included features of inflammatory back pain (IBP) such as age at onset less than 40 years, duration of back pain greater than 3 months, insidious onset, morning stiffness, improvement with exercise, no improvement with rest, alternating buttock pain and pain at night with improvement upon getting out of bed. Furthermore, information on extra-spinal manifestations (current or in the past), ie, enthesitis of the heel, peripheral asymmetric oligoarthritis, uveitis, dactylitis, psoriasis, inflammatory bowel disease (IBD) and a positive family history of SpA (AS, reactive arthritis, psoriasis, IBD, or uveitis) was also provided in a categorical manner as “yes” or “no”. The response of back pain to a full dose of non-steroidal anti-inflammatory drugs (NSAID) was provided as “not anymore present”, “much better”, “a little bit better” and “not better” or as “not assessed”. HLA-B27 status was provided as “positive” or “negative” and acute phase reactants (C-reactive protein (CRP)/erythrocyte sedimentation rate) as “elevated above normal” or “not elevated”. Information about sacroiliitis on plain radiographs was provided for each sacroiliac joint separately according to the grading applied in the modified New York criteria (grade 0 to grade 4). All patients had undergone MRI investigation of the sacroiliac joints, and MRI findings were provided as presence or absence of active (acute) inflammation. Information on structural changes (that may reflect previous inflammation) on MRI was not assessed systematically in all patients and, therefore, was not included in the analysis. All radiographs and MRI from patients selected for this study were reviewed during weekly conferences of rheumatologists (MR, JS) and radiologists, and readings were done by consensus. Sixty-nine of the 71 patients did not have definite sacroiliitis according to the modified New York criteria (bilateral grade 2 or unilateral grade 3 or higher). These patients, therefore, represent a population with possible non-radiographic axial SpA. In order to estimate the diagnostic yield of MRI in establishing a diagnosis of non-radiographic axial SpA, the clinical records of the 71 patients were sent twice to the experts in random order: once with and once without information on MRI findings. All experts thus reviewed in total 142 “paper patients”. We considered it crucial that patients were classified unequivocally as “SpA” or as “no SpA” and patients in whom experts disagreed on the classification were excluded from analysis. To aggregate the judgement of all 20 experts on disease classification as well as on their level of confidence with this decision we plotted the frequencies of classification decisions (“SpA” or “no SpA”) per patient against the level of confidence of each decision. Each histogram visualising the judgements of 20 experts on a single patient was then evaluated independently by five reviewers (MR, RL, DvdH, JL, JS); each reviewer decided whether the 20 experts agreed on the classification as “axial SpA” versus “no SpA”, or whether a patient should be considered “unclassifiable” because disagreement among experts was too high. If at least four out of the five reviewers arrived at the same judgement the patient was classified accordingly. If less than four out of the five reviewers arrived at the same judgement the patient was considered as “unclassifiable”. Two examples of such histograms are shown in fig 1. Histograms aggregating the opinion of 20 experts on individual paper patients. In each histogram, the number of experts (y axis) in conjunction with their respective level of confidence (x axis; 0 = not confident, 10 = very confident) with the judgement (spondyloarthritis (SpA) or no SpA) for an individual patient is shown. (A) Example of a paper patient classified as SpA by the five reviewers based on the aggregated expert opinion: 16 experts judged the patient to have SpA (with high levels of confidence) and four experts judged the patient to have no SpA (with moderate levels of confidence). (B) Example of an unclassifiable patient: nine experts judged the patient as no SpA and 11 experts judged the patient as SpA, both with moderate to high levels of confidence. The development of candidate criteria for axial SpA was based initially on clinical reasoning, which included MRI as a substitute for radiographs for imaging sacroiliitis, and recent proposals for making an early diagnosis13 and was adjusted according to the results of this study. The aggregate variable extra-spinal clinical manifestations (box 1) was tested in different ways: (1) considering all extra-spinal manifestations as equally important and giving the same weight to any one present up to a maximum of three manifestations (ES3); (2) considering a maximum of two of the extra-spinal manifestations as important and giving weight to these two but not to any further manifestation if present (ES2); (3) considering the variable extra-spinal manifestation as a single variable only (independent of how many of the extra-spinal manifestations were actually present) and giving a weight of 1 (ES1). The role of MRI for the classification of patients was evaluated using a flow diagram (fig 2) and by logistic regression analysis. Unequivocally classifiable patients were used to develop and evaluate candidate criteria for axial SpA by cross tables. Flow diagram of patients’ classification with and without knowledge of magnetic resonance imaging (MRI) findings of the sacroiliac joints, and the resulting changes in the disease classification upon knowledge of MRI findings. A positive MRI result refers to active (acute) sacroiliitis on MRI. A negative MRI result refers to the absence of active sacroiliitis or any other active inflammation on MRI. SpA, spondyloarthritis. The clinical and demographic findings of the paper patients selected for this exercise are shown in table 1. When paper patients were presented without MRI information, 33 patients were classified as SpA, 15 as no SpA and 23 patients as unclassifiable. 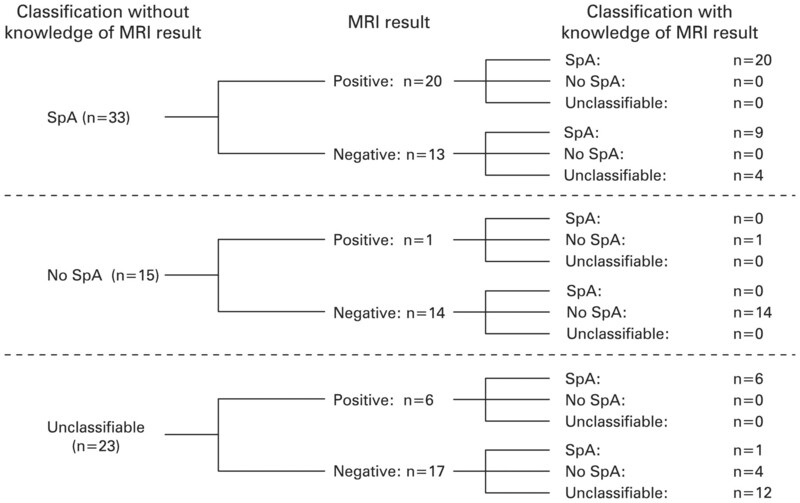 When paper patients were presented with MRI information, 36 were classified as SpA, 19 as no SpA and 16 as unclassifiable (fig 2). Active sacroiliitis on MRI was present in 27 of the 71 paper patients (38%). It was anticipated that the judgement of the experts on the classification of these paper patients, who did not have definitive radiographic sacroiliitis, would be influenced by information about the presence or absence of active sacroiliitis on MRI. In fact, in 15 of 71 paper patients (21.1%), the classification by the experts changed once MRI information was provided. Of the 23 paper patients who were unclassifiable when judged without MRI information, 11 patients were classifiable when MRI information was available: seven were classified as axial SpA (six of seven had a positive MRI, ie, active sacroiliitis on MRI) and four were classified as no SpA (all four patients were negative for active sacroiliitis on MRI). Furthermore, four patients classified as axial SpA in the absence of information on MRI were judged as unclassifiable when information on MRI was provided (all four patients were negative for active sacroiliitis on MRI). MRI activity information thus contributed substantially to the transition from an unclassifiable status (expressing uncertainty among experts) to a classifiable status (fig 2). Furthermore, MRI activity was found to be a strongly contributory variable in the classification of axial SpA when using logistic regression analysis (odds ratio 45, 95% CI 5.3 to 383; p<0.001). Table 1 shows that the majority of characteristics associated with SpA occurred more frequently in the group of patients classified as SpA as opposed to the no SpA group. As it was felt that the new criteria should include the possibility to classify axial SpA solely on the basis of clinical criteria, the six clinical variables listed in box 1 were selected for further development of candidate criteria. Regarding combinations of clinical variables, the best trade-off between sensitivity and specificity was found if at least three of the six clinical variables were present (sensitivity 61.1%, specificity 84.2%). We did not find major differences when combinations with ES1, ES2 or ES3 were taken into consideration. Excluding the variables CRP, good response to NSAID and a family history of SpA each resulted in increased specificity (from 84.2 to 94.5–100%) but in decreased sensitivity (from 61.1 to 47.2–55.6%). Therefore, these parameters were retained in the analysis. When combining the clinical variables with the imaging criterion (sacroiliitis on MRI or on x rays), the set of criteria shown in fig 3(A) performed very well (sensitivity 97.2% and specificity 94.4%) and was selected as candidate criteria set 1. We also constructed a second set of criteria (candidate criteria set 2) shown in fig 3(B), which is similar to set 1 but differs in the clinical criteria arm in which the variable IBP (defined as IBP experts) is obligatory. Allowing a maximum of two extra-spinal manifestations, set 2 had a specificity of 97.2% and a sensitivity of 86.1%. Two sets of candidate criteria for the classification of axial spondyloarthritis (SpA). The criteria differ only in the clinical arm of the criteria. In set 1 (A) any three or more of SpA features are required for the fulfilment, whereas in set 2 (B) inflammatory back pain (IBP) is obligatory in addition to at least two other SpA features. CRP, C-reactive protein; ES, extra-spinal manifestation; ESR, erythrocyte sedimentation rate; MRI, magnetic resonance imaging; NSAID, non-steroidal anti-inflammatory drug. The candidate criteria set 1 and set 2 were compared with the original ESSG and Amor criteria, as well as with modifications of these incorporating MRI. In the ESSG criteria sacroiliitis on MRI was added to the list of parameters of which at least one is required in addition to IBP or peripheral arthritis. In the Amor criteria sacroiliitis on MRI was added to the imaging section and assigned 3 scoring points, similar to radiographic sacroiliitis. As can be seen from table 2, the ESSG criteria did not perform well in comparison with the two proposed candidate criteria, even after modification. However, the Amor criteria modified for MRI performed similarly well in comparison with the proposed candidate criteria. There is a need to conduct clinical trials and other studies in patients with non-radiographic axial SpA because the burden of disease in these patients can be substantial and effective therapy is possibly available.9 17 18 However, widely accepted classification criteria for conducting such studies are lacking.8 In the process of developing such classification criteria we integrated clinical data from real patients and the expert opinion of 20 internationally recognised experts in the field of SpA, all of them being members of the ASAS. Clinical data from real patients were provided on paper as “paper patients” to the experts. All patients had chronic back pain of unknown origin, had a few SpA features and, therefore, had a possible diagnosis of SpA. As the great majority (96%) of the patients did not have definite radiographic sacroiliitis, these patients were regarded as possible non-radiographic axial SpA. 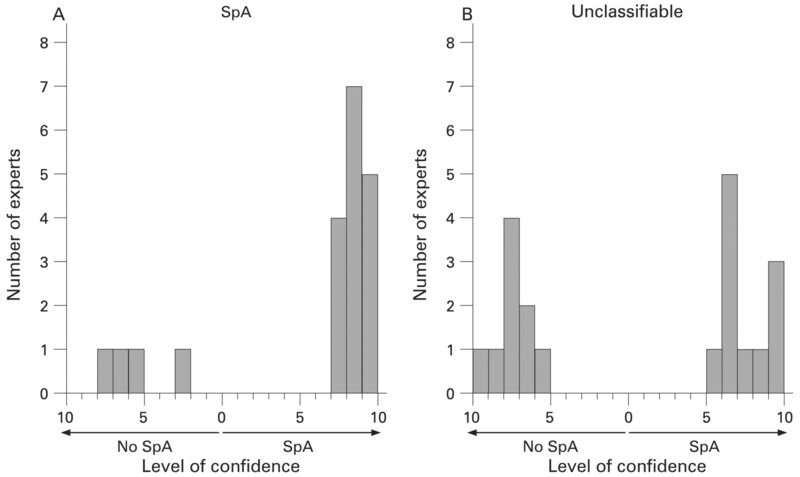 For each paper patient 20 expert judgements on the classification as axial SpA or no SpA and the level of confidence with the classification were obtained, plotted in histograms and were reviewed by five individuals. By using this approach we ensured that the classification of each paper patient as axial SpA or no SpA indeed reflected a true majority expert opinion, and that paper patients on which the experts clearly disagreed were considered as unclassifiable and were excluded from further analysis. To our knowledge, this is the first time that multiple expert classifications of the same patient were aggregated using expert-reported information about the level of confidence of their judgement. Frequently, aggregated decisions are simply majority judgements, but majority judgements ignore the fact that forced decisions (eg, SpA or no SpA) are often made with a high level of uncertainty. The incorporation of the level of certainty in the process of obtaining aggregated classifications, as we did in this study, therefore adds to the validity of disease classifications, because it allows the delineation of the subgroup of unclassifiable patients that should better be excluded from criteria development. Paper patients have been applied successfully in the development of classification or response criteria in other fields in rheumatology.19–23 However, information based on paper patients may have limitations.23 For example, the clinical SpA features in the paper patients were provided mainly as the presence or absence (yes/no) of a particular finding. Such clinical information may not be detailed enough for the expert to decide on a particular parameter or disease classification, and more elaborate descriptions may in fact provide a better picture of the patient.24 On the other hand, this type of brief information (absence or presence of a parameter) is exactly what classification criteria usually consist of. Other concerns with paper patients relate to validity aspects; the clinical assessment of a real patient may lead to different decisions when compared with decisions based on paper information.23 However, feasibility has also to be considered. Only the use of paper patients enabled us to include the opinion of 20 experts in the field from many places worldwide, therefore benefiting from their experience. MRI has evolved as an important imaging modality for the diagnosis of non-radiographic axial SpA because MRI may detect active (acute) sacroiliitis in the absence of radiographic sacroiliitis. The contribution of MRI to the classification of our paper patients was found to be substantial because the knowledge of MRI of the sacroiliac joints led to a change in the classification in as many as 21% of the patients, mainly in the group of unclassifiable patients. This figure may be a conservative estimate and may increase as familiarity with MRI increases. After testing various combinations of clinical variables (SpA features) and imaging modalities, two conceptually similar sets of candidate classification criteria for axial SpA emerged from this study. 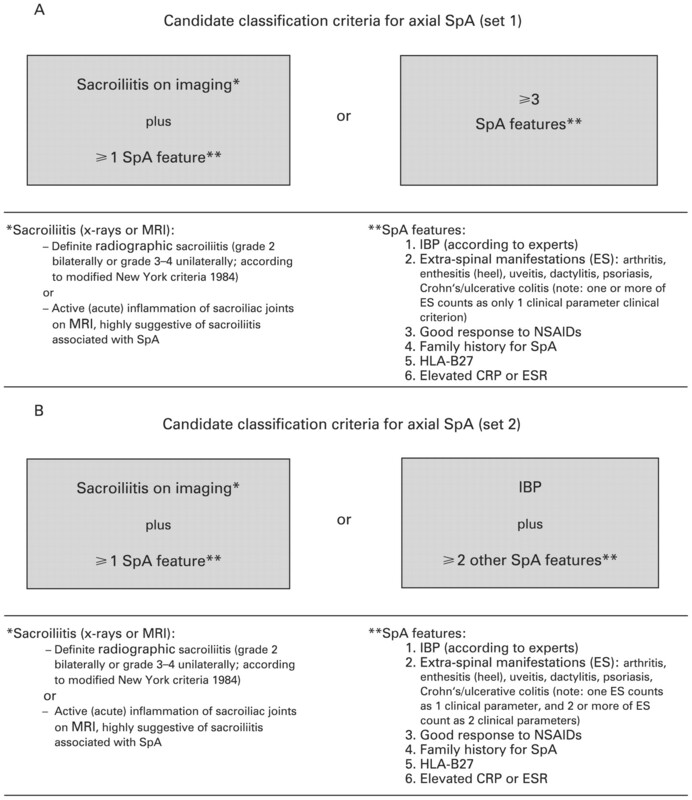 According to the proposed candidate criteria patients can be classified as axial SpA either on the basis of sacroiliitis on MRI or on radiographs in conjunction with at least one clinical SpA feature, or—in the absence of supporting imaging results—on the basis of the presence of at least three SpA features. The requirement of the presence of at least three SpA features in the absence of sacroiliitis is in line with previous suggestions on making a diagnosis of non-radiographic axial SpA.8 13 15 In the opinion of the authors both sets of candidate criteria have good face validity, in that they contain all relevant aspects of the clinical spectrum of axial SpA that includes both patients with radiographic sacroiliitis (classic AS patients) but also patients with non-radiographic axial SpA. Whether IBP should be an obligatory parameter in the clinical arm of the criteria—as is the case in candidate criteria set 2—cannot be decided based on the data from this study. Furthermore, the inferiority or superiority of the new criteria in comparison with ESSG14 or Amor15 criteria cannot be decided from this study.
. Clinical features and prognosis of patients with possible ankylosing spondylitis. Results of a 10-year follow-up. J Rheumatol 1988;15:1109–14.
. The familial form of spondylarthropathy: a clinical study of 115 multiplex families. Groupe Francais d’Etude Genetique des Spondylarthropathies. Arthritis Rheum 2000;43:1356–65.
. Early detection of sacroiliitis on magnetic resonance imaging and subsequent development of sacroiliitis on plain radiography. A prospective, longitudinal study. J Rheumatol 1999;26:1953–8.
. Undifferentiated spondyloarthropathies: a 2-year follow-up study. Clin Rheumatol 2001;20:201–6.
. Spondylitic disease without radiological evidence of sacroiliitis in relatives of HLA B27 positive patients. Arthritis Rheum 1985;28:40–3.
. The challenge of diagnosis and classification in early ankylosing spondylitis: do we need new criteria? Arthritis Rheum 2005;52:1000–8.
. The early disease stage in axial spondyloarthritis – Results from the German Spondyloarthritis Inception Cohort (GESPIC). Arthritis Rheum 2009;60:717–27.
. Use of dynamic magnetic resonance imaging with fast imaging in the detection of early and advanced sacroiliitis in spondylarthropathy patients. Arthritis Rheum 1994;37:1039–45.
. Imaging in spondyloarthropathies. Curr Rheumatol Rep 2004;6:102–9.
. Severity of baseline magnetic resonance imaging-evident sacroiliitis and HLA-B27 status in early inflammatory back pain predict radiographically evident ankylosing spondylitis at eight years. Arthritis Rheum 2008;58:3413–18.
. How to diagnose axial spondyloarthritis early. Ann Rheum Dis 2004;63:535–43.
. The European Spondylarthropathy Study Group preliminary criteria for the classification spondylarthropathy. Arthritis Rheum 1991;34:1218–27.
. Critères de classification des spondylarthropathies. Rev Rhum 1990;57:85–9.
. New criteria for inflammatory back pain in patients with chronic back pain: a real patient exercise by experts from the Assessment of SpondyloArthritis international Society (ASAS). Ann Rheum Dis 2009;68:784–8.
. Efficacy of adalimumab in the treatment of axial spondylarthritis without radiographically defined sacroiliitis: results of a twelve-week randomized, double-blind, placebo-controlled trial followed by an open-label extension up to week fifty-two. Arthritis Rheum 2008;58:1981–91.
. Clinical and imaging efficacy of infliximab in HLA-B27-positive patients with magnetic resonance imaging-determined early sacroiliitis. Arthritis Rheum 2009;60:946–54.
. Clinical judgment in rheumatoid arthritis. III. British rheumatologists’ judgments of ‘change in response to therapy’. Ann Rheum Dis 1984;43:686–94.
. Defining response in systemic lupus erythematosus: a study by the Systemic Lupus International Collaborating Clinics group. J Rheumatol 2004;31:2390–4.
. Developing classification criteria for peripheral joint psoriatic arthritis. Step I. Establishing whether the rheumatologist’s opinion on the diagnosis can be used as the “gold standard”. J Rheumatol 2006;33:552–7.
. Development and validation of a consensus methodology for the classification of the ANCA-associated vasculitides and polyarteritis nodosa for epidemiological studies. Ann Rheum Dis 2007;66:222–7.
. Written case simulations: do they predict physicians’ behavior? J Clin Epidemiol 1990;43:805–15.
. Lessons from an international survey of paper cases of 10 real patients from an early arthritis clinic. CRI (Club Rhumatismes et Inflammation) Group. J Rheumatol 2001;28:975–81.
. The development of Assessment of SpondyloArthritis international Society classification criteria for axial spondyloarthritis (part II): validation and final selection. Ann Rheum Dis 2009;68:777–83.